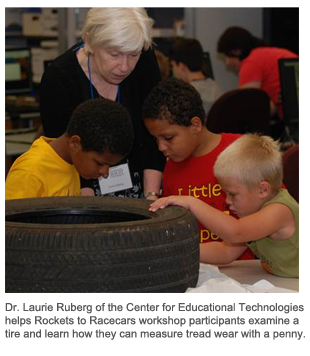 See pictures from the Wheeling Rockets to Racecars event! The NASATalk web collaborative celebrated the July 20 grand opening of the space shuttle Enterprise exhibit at the Intrepid Sea, Air & Space Museum in New York City by hosting a full day of NASA DLiNfo Channel video feed featuring multiple professional development activities for teachers. Highlighting the sessions were the Rockets to Racecars workshop and other live events from the 2012 Samsung SpaceFest at the museum. Following the hands-on and demonstration activities facilitated by NASA education specialists, educators gained tips on how to integrate the shuttle tire STEM activities while looking ahead to consider the upcoming Curiosity rover's six-wheel tire landing on Mars. Don Watson, manager of video support services at the Center for Educational Technologies, was on hand in New York City to coordinate the production for the DLiNfo Channel. He said the broadcast reached more than 5,000 professional educators, including the 54 teachers at the live SpaceFest workshop aboard the Intrepid. At the Center for Educational Technologies 25 people took part in the Rockets to Racecars workshop via the DLiNfo Channel. Participants ranged in age from 3 to 80 and included Lt. Col. Dale Olson, the retired commander of the HC-130 search and rescue aircraft at Cape Canaveral the day of the Challenger tragedy. Participants worked through six hands-on interactive space education stations to earn a NASATalk participation badge. NASATalk logged 216 unique visitors to the online event. NASATalk is designed and managed by the NASA-sponsored Classroom of the Future as a virtual place for parents and educators to talk and learn about the many opportunities available from NASA.